This easy-to-use kit that turns summer melons and pumpkins into all-natural kegs. 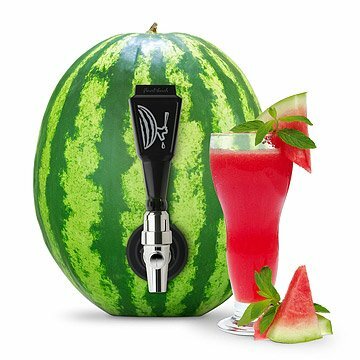 Tap seasonal drinks straight from the source with this easy-to-use kit that turns summer melons and pumpkins into all-natural kegs. Simply slice the bottom off the fruit to create a level base, then hollow it out and fill with fruit juice, liquor, or a cocktail of your own creation. When inserted into the fruit, the shank and faucet–combo dispenses its tasty contents in a steady stream. Fill your melon with a refreshing fruity blend at summer picnics and barbecues, or serve a spiced pumpkin pick-me-up at an autumn harvest. Made in China. Click here for instructions on how to use the Fruit Keg Tapping Kit . This is a fun creative way to serve fun beverages. Ha ha sorry see above! This was a perfect gift for my brother and his girlfriend who love aqua frescas. I wish I had read the description a little better I though. A fun prize for a race and something I thought not everyone would have and could use for future entertainment. I would recommend this item to everyone! This was amazing product. Everyone loved it!!! An unusual product which is not found in every household! I purchased the fruit keg-tapping kit as a birthday gift for a new member of my family. She loves gadgets, and plans on using my present for a party on the 4th of July. I chose it because I thought it was a fun and clever idea for a summer party (with a watermelon) or for Halloween (with a pumpkin.) I wanted to get her something unique and original.